Althea Ducati men Carlos Checa and Shane Byrne topped the time sheets in the opening free practice session at Imola today. The two Ducati men ran at the front for the majority of the session and were backed up by Xerox Ducati rider and 2009 Imola race winner Michel Fabrizio in third. Speaking to MCN, Shakey said: “We came here with one bike set as we had it for the test here and one bike as we rode it at Nurburgring. The bike from the test initially felt better, but after making the nurburgring bike stiffer I got a really good feeling. 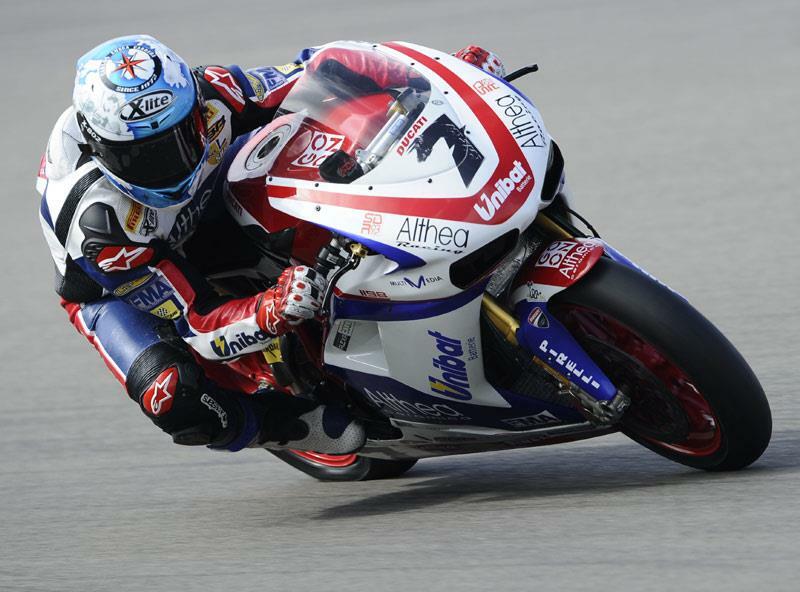 Jonathan Re was the first non-Ducati rider in fourth onboard his Hannspree Ten Kate Honda. Kawasaki rider Tom Sykes made an impressive start to his weekend and held first position towards the end of the session before being relegated to fifth spot. In terms of the overall championship, series leader Max Biaggi secured ninth place onboard his factory Aprilia with Brit Leon Haslam still struggling with his damaged knee ligaments two places further back in 11th.